Hi everyone! I have another review for L-Email/ Wig Supplier. This time, I chose their Shiro No Game No Life Wig and made a video all about it! Please watch it here too! It contains the unboxing and when worn part. L-Email is a very known and trusted company. I can guarantee that you will be getting what they show. Their quality is also great and worth every amount you pay for. If you want to save more, use my code below to get a discount. This is how the wig looks in real life. The left is the one without flash while the left is with flash. Honestly, there isn’t much difference between them. That goes to show how excellent this wig really is! 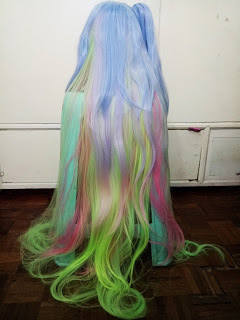 Since the wig is 120cm long, it easily tangles. However, this wig is extra smooth and silky so you can fix it in a few minutes. 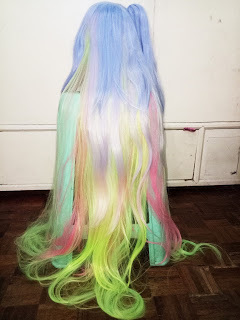 This is how the top and inside of the wig looks like. Sadly, the top is quite messy. It’s not like other wigs where it has one clear origin where the strands are connected. It looks rather pasted but aside from it, it’s ok. 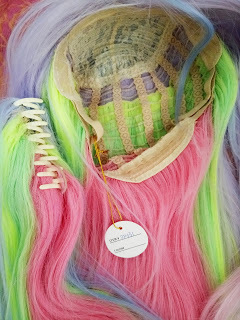 The inner of the wig is absolutely beautiful tho! The lace is adjustable to fit the size of your head and the clip-on has a strong grip! There was also a tag attached to it. Here’s the picture when worn. The wig looks exactly like the stock photo. It had the same color, hue, brightness and even length. It really is so perfect for Shiro and I believe that this one is the best one there is. The wig is not that shiny. It has the right amount of shine that prevents it from looking too cheap ,irritating ,dull and boring. The tips of the hair has a beautiful rainbow gradient. It looks absolutely colorful but the colors are well mixed in.
. The wig is super smooth, and very manageable. You can easily run your fingers through their strands. The wig has a good volume. In fact, it is quite heavy even without the clip-ons attached. It barely shreds but even if it did, it’s so thick! 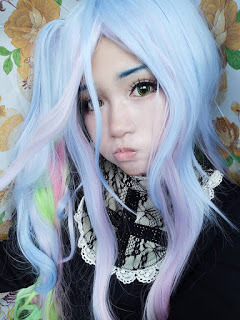 For a wig like this, I think it is very worth the price. Most wigs like these would cost twice or trice more without shipping. I’d definitely chose this over anything else! This is the best Shiro wig ever! I’m not exaggerating because I have seen other kinds both online and in real life. 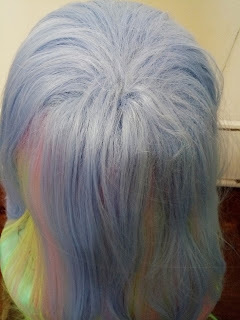 Some wigs have less colors and even no clip on while others have too harsh and intense colors. If you want to look your best, I suggest that you choose this! Don’t forget to use my code “berrylonely” for 10% off. 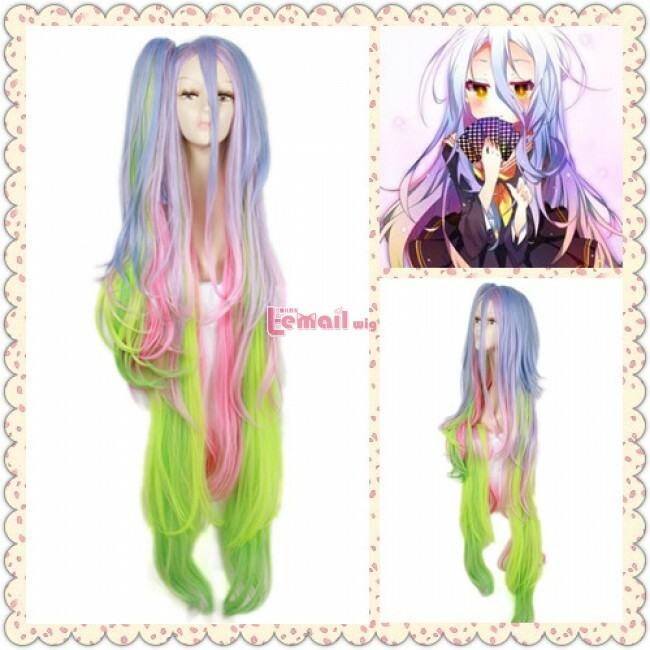 This entry was posted in Buy Cosplay Wigs, Fashion Wigs, Human Hair Wigs, L-email Wig review, Wig Maintenance and Care, Wigs, Wigs Hairstyle Selections and tagged anime cosplay, anime cosplay wig, anime wigs, best cosplay wigs, cheap cosplay wigs, cheap wigs, cosplay, cosplay ideas, cosplay store, cosplay wig, cosplay wigs, cosplayers, fashion wig, fashion wig store, L-email wig review, L-email wigs, long wave wigs, long wigs, synthetic fashion wigs.